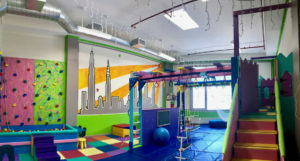 Theraplay LIC is a new state-of-the-art pediatric sensory gym located in Long Island City, Queens, New York. Your child’s senses will be stimulated by our specialized play equipment. Our innovative play equipment includes 12-foot climbing walls with rope pulls, a giant ball pit to “crash” into, multiple rotary and linear swing attachments with varied swings, monkey bars, zip lines, tunnels, trapeze bars and rings, as well as ladders with varied rungs and a scooter ramp complete with rope pulls. But the highlight of our sensory gym is a a special two story castle play structure complete with fine motor areas where your child can learn increasingly more complex tasks. Our castle includes a laser kaleidoscope for visual stimulation, stairs to climb, a slide and many windows and doors to open, close and peek through! 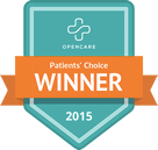 Kim Mitchell is the primary owner and Clinical Director. Kim is a physical therapist who received her Masters degree in physical therapy from the University of Hartford. She has a Bachelors degree in Health Science with a minor in Psychology. Kim has been working with children with developmental differences for over 7 years in the home, school, and gym setting. 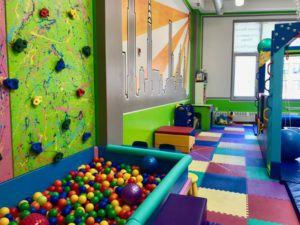 Theraplay’s original location is located in Manhattan’s Upper East Side and recently acquired Sensory City in Long Island City in July of 2017. Prior to finding her passion with children, she worked at New York City’s Bellevue Hospital on their Traumatic Brain Injury and Rehabilitation unit. 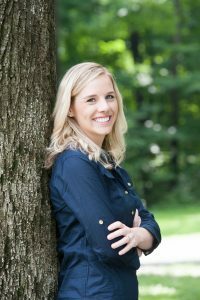 Kim believes in a whole child approach to treatment and is trained in NDT, sensory processing, and orthotic assessment. She is currently completing a fellowship in Infant Parent Mental Health at the University of Massachusetts Boston.